There is a spider that lives in the Swiss alps, the elastichspinne, that makes its web in pretty windy places. Some elastichspinne’s have been recorded as making more than a hundred webs, each of which is blown away by the wind before they even catch a single fly. Whilst spiders are not themselves great learners, this spider illustrates one of the key features that all great learners have; grit or the ability to stick at something. Here at the Extraordinary Learning Foundation™, we see grit as one of the four learning limbs that we must ensure that our young learners sprout. The head represents curiosity because the eyes are always looking and the ears are always listening. The legs represent grit because they are the stable base that supports learning. 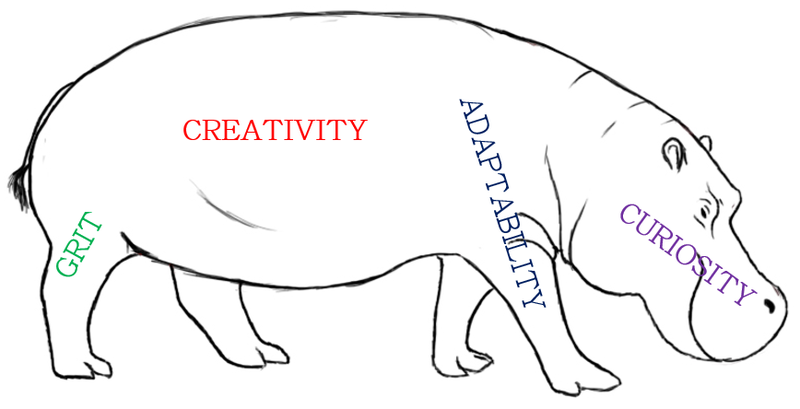 The arms represent adaptability because arms are capable of being put to many different uses. The torso represent creativity because that it what is left. Many of the schools that work with us here at the Extraordinary Learning Foundation™ use this model in every lesson in order to raise children’s meta-cognitive consciousness so that they can deploy these learning limbs deliberately and consciously. There has been much research into this area and such meta-cognitive strategies have been shown to be highly effective. I’m sitting at the back of Dana Rece’s Grade 9 class at the Central International School in Utaga. Dana is resplendant and glowing in a purple shawl. The buzz of excitement in the room is adiabatic. The children sit at their study pods, discussing the science investigation that they have just been working on. Dana Rece waits for a few moments in order to give her students plenty of time to Talk-it-out™. “Yeah, that’s the legs,” replies Katia. “And why the legs?” Dana continues to probe. A compact young man with a broad smile indicates that he wishes to speak. “Go on, John,” Katia encourages.